When I was in college, I was friends with a group of women who shared a flat on Divisidero Street in San Francisco, decades before it became a trendy neighborhood. In the 1980’s, four college students living on four or five hundred dollars a month each could come up with enough money to rent a flat. As longs as no one spends all the rent money on cocaine. One month, that happened. The leaseholder, who collected all the cash, spend the rent money on cocaine. When the land-lord came to call, they almost all ended up on the street. One of them managed to convince the landlord to give them an extra month to come up with the money and to move the lease over to a different room-mate. The former leaseholder, the one with the fondness for cocaine, was evicted by consensus. So, yes, I do understand that addiction is a disease, but the rent is the rent. Which is why I have less patience for stories of addiction than I might have. Which is why I had a tough time with Michelle Tea’s novel, Black Tea. I should have liked it more. The first half of the story is set in San Francisco, much later, some 30 years or so, than my college days, but familiar territory that I am fond of. The main character is a lesbian woman who shares the flat with a series of roommates and girlfriends. She even works in a book store. But, boy does she use a lot of drugs. I kept thinking as I read her story that her roommate should throw her out. So I found it all very tough reading in the same way I found Charles Bukowski’s Ham and Eggs tough reading. I just don’t have much interest in stories of how far addicts go to serve their addiction be it alcohol or hard drugs. Still, since Black Wave is in the Tournament of Books this year, I kept reading. I think I’m glad I did. Just short of halfway through the novel, the story shifts to Los Angeles. The main character then turns to the reader to admit that not all of what she has told us so far is true. The girl she introduced briefly as a sort of one-night-stand was really a long-term girlfriend. She just didn’t want to be included in this “memoir.” Other details had been changed as well. So what’s really going on. In Los Angeles we discover that the world is about to end. Things are decaying around the main character who manages to get a job in a bookstore like the one she had in San Francisco. Things get worse, gradually then dramatically. It’s an unclear end of the world scenario that features the main character in a bookstore strewn with unshelved books, reminding me of Paul Auster’s wonderful novel In the Country of Last Things. But Mr. Auster and Ms. Tea are up to very different things. Ms. Tea is doing something much more in line with Samuel R. Delany’s Dahlgren in which a city, probably New York, decays in chaos while the hippie-like main characters build a temporary utopia amid the soon to be ruins of civilization. I loved Dhalgren and came to enjoy the second part of Black Wave. But what really surprised me about Black Wave is how moved I was at the ending. Even though I was enjoying the book by the end, I did not expect to care about the main character, this drug addled hipster with an attitude she is in no position to hold. But I was. The final scene, her last moments of life, struck me, profoundly struck me. I did not expect that, not at all. 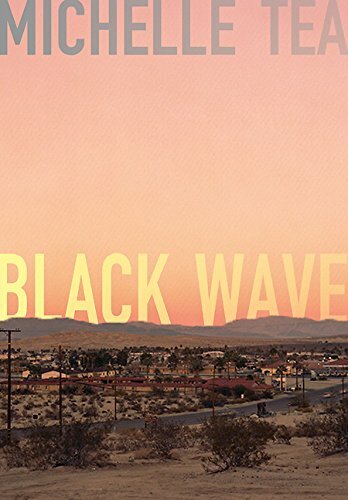 So I think I’m recommending Black Wave. 100 pages into the book I was ready to lay it aside for good, but by the final words on the last page I was thinking I might read more by Michelle Tea. I think that’s a recommendation. We have the exact same take on this book. As far as the TOB goes, in the cold harsh light of day, as I sometimes like to say, the better book won. Underground Railroad, while not my favorite book for a couple of reasons, is a wonder.